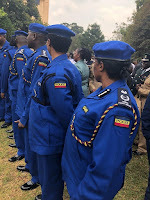 Thursday September 13, 2018 - Millions of Kenyans are now questioning why the new police uniform has larger pockets and who is behind the tender. President Uhuru Kenyatta unveiled the new uniforms on Thursday. The Head of State said it is important for the police to note that Kenyans are funding the changes so that they can provide better services. However, many were not pleased with the Government’s move and said Jubilee is a big joke because Kenyans were expecting better police reforms only to realise it was all about uniforms. “Next, you'll hear someone pocketing Sh5 billion just for belts,” said Mercy Njoki. “The only thing Jubilee saw worth fit of change is the uniform!” he said.